Appearance : Measuring between 10 and 15 mm adult size, silver fish has a partially developed faceted head with eyes and is extended by two long antennae. The abdomen meanwhile concludes with three “tails” called tails. It is extremely clever and fast despite its small size. Habits : Common in forestry and domestic housing, especially in kitchens and bathrooms, he is particularly fond of dusty and humid and warm premises: a moisture content greater than 75% and a temperature of 27 ° C seem favorable to its development. Nourishment: Polyphagous acts primarily as a cleaner by feeding the many microscopic debris littering its habitat (debris, food, paper …). Reproduction : When fertilization occurs, the female lays eggs whitish oval, over several weeks at a rate of 1 to 3 eggs per day. The female can lay 20 to 150 eggs in her lifetime. The eggs hatch between 2 weeks and 6 months later depending on conditions. Do not wait to be infested! 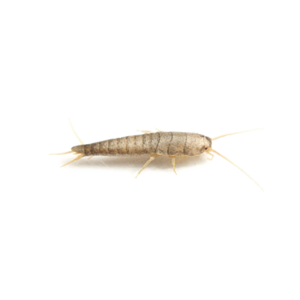 For the extermination of silverfish, call Groupe AZ Extermination. His professional inspection is free, effective and very fast.